This is a shared ownership agreement for a sport horse, where one of the owners is a competition rider, and the other a financial backer. This document records the arrangement and the obligations of each owner to the other and to the care of the horse. Sharing ownership of a sport horse has advantages for both the rider and backer. It can give a rider a financial or motivational incentive to perform, and it can reduce the upkeep costs and the responsibility of the backer. Just as in any business arrangement, an informal agreement can lead to numerous problems later. The aim of this horse sharing agreement is to set out not only a record of ownership, but of agreed responsibility: for management, care and competitions. With it, backers will find that they aren't just a source of finance. We haven't used any legal jargon, so the document doesn't come across as being overly formal. It will however, protect your investment in the horse, and help prevent disagreements. This document is suitable for sharing arrangements where the horse will be ridden by a professional, but most likely majority owned by a financial backer who is unlikely to ride. You should ideally consider the points in this document before you commit to sharing, and then finalise the document soon after. For example, do you want the rider to use specific service providers such as vets? Who will pay for what expenses, and who decides how to keep the horse? Consider the areas where something may go wrong with the proposal and ask “what would we do if…” We suggest writing brief notes between you as to how your arrangement will work, then formalise the agreement with this document. We have another sharing agreement for horses, where both owners are riding recreationally. 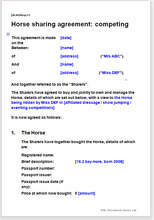 See Horse share agreement: recreational riding.